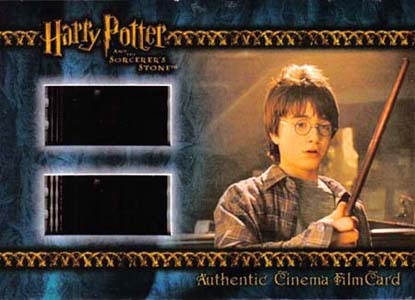 Despite being based on the first film, 2005 Artbox Harry Potter and the Sorcerer's Stone was not the company's first set of Harry Potter cards. It actually came out in between the release of the third and fourth films. Artbox didn't get the license until The Prisoner of Azkaban. The base set has 90 cards that recap the film that started it all. 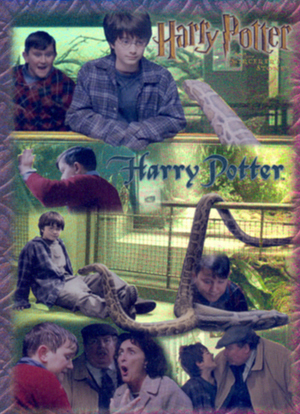 It has a similar style collectors came to recognize with most of the Artbox Harry Potter trading cards. A header card leads the set while a checklist finishes it. Character cards kick off the meat of the set with a vertical design. Following that are synopsis cards that switch to a horizontal format. 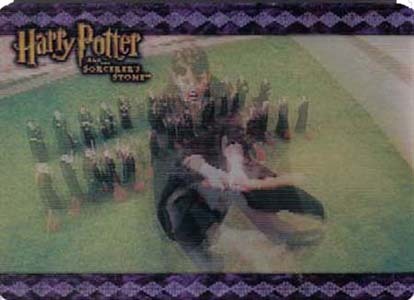 These cards use a large shot from the film as well as a short caption. Card backs offer a generous synopsis. 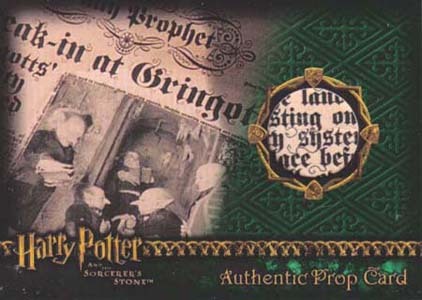 All base cards have foil accents as well with the Harry Potter logos. 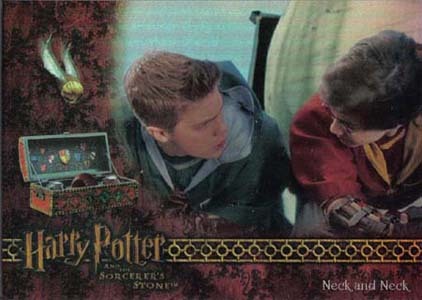 2005 Artbox Harry Potter and the Sorcerer's Stone doesn't stray far from the rest of the company's other sets for the franchise. 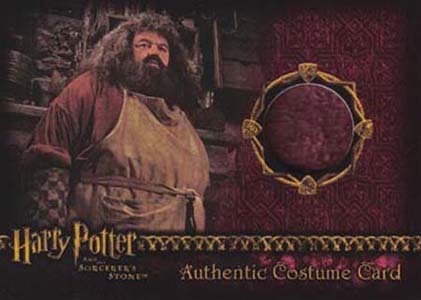 Inserts are led by a wide mix of autographs, costume cards and prop cards. 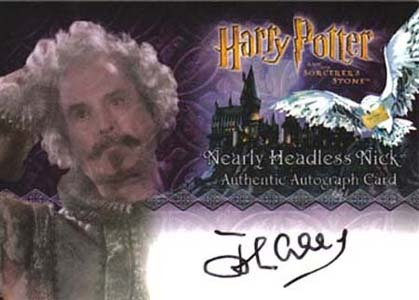 The autograph lineup is one of the weaker ones, although it does include Monty Python legend, John Cleese. Two-time Academy Award nominee, John Hurt also signed for the set. Costume and prop cards all come with varied numbering. Both are inserted 1:48 packs. Like most of Artbox's Harry Potter sets, there's a nice variety of materials used to build these checklists. The final hit-type inserts are Cinema Film cards, which have a couple of actual movie cells embedded into the card. All are numbered to 397. 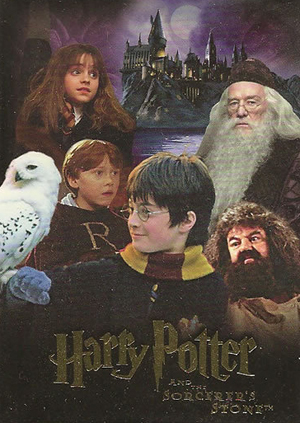 A total of 800 hobby cases of 2005 Artbox Harry Potter and the Sorcerer's Stone were produced. Most boxes come with two total autograph, costume, prop or cell cards, although some only have one. 24 There's No Such Thing as Magic! 49 A Bit Beyond Your Reach? 54 Troll in the Dungeon! 74 Does It Seem A Bit Quiet? 80 What Do You See? 83 What Is This Magic? 14 cards. Inserted 1:48 packs. Inserted one per sealed box. BT2 Ten Points for Gryffindor! Inserted 1:80 packs. Numbered to 397. 9 cards. Inserted 1:5 packs. Cards are lenticular. Print runs stated below. One random Wizard Coin card given for every 25 cases ordered. Available only at the 2006 San Diego Comic Con. Limited to 200 sets. Sets originally came with a certificate of authenticity.